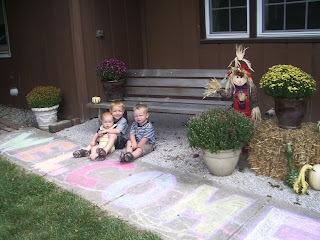 Yesterday, the boys and I did an outdoor project. I love the Fall season, and it is actually becoming my favorite season as I get older, over summer. I love the cooler temps, being able to open the windows again and turn off the A/C, and watching the leaves turn beautiful colors. I have recently decorated the front of our house with fall items--mums, pumpkins and gourds, straw bales, scarecrows...you get the idea. 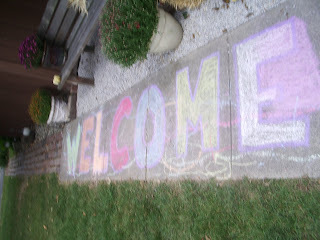 Colin and Cameron LOVE drawing with sidewalk chalk, and I thought it would be a great idea to have them help me add a home-made touch to our decorations....a Welcome sign on our sidewalk. So, we did just that. I think their masterpiece turned out great, and we had a lot of fun doing it!